Guerrilla War: An Expected Review by Bobak! With Ikari Warriors, SNK set a standard for action-war games. 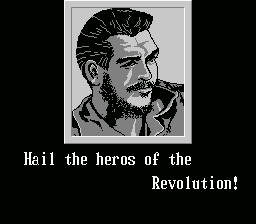 After many different sequels and spin-offs, they came up with a new theme: Revolutionary Cuba in Guerrilla War. "Revolutionary Cuba?" you ask. Yes, the original Japanese title of Guerrilla War was "Guevara," inspired by the actions of Che Guevara and Fidel Castro to liberate Cuba in the 1950s. Some people (particularly a few choice senators from the South) find this pick of protagonists surprising. 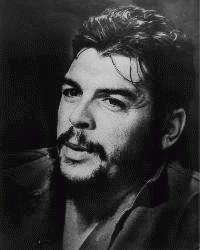 However, an inquisitive mind would need look no further than the global commons: Che is a worldwide cultural icon. You can walk the streets of Paris, Mexico City, Tehran, or Tokyo, and there will be people who know Che. Most Americans have seen him but not realized it; his famous image that has donned millions of shirts, stickers, and Rage Against the Machine posters since even before his murder in 1968. Yet, like Bob Marley, this following remains much stronger outside than inside the United States. In the US, Che is a touchy subject because of his long association with Fidel Castro (a relationship that ended in the mid-60s, but that's for a history article, not a video game review). Because of the heavy antagonism between Castro and some of the US government (and globally speaking it is only the US government), selling a game where Player Two controls a gun-toting Fidel may be tough job. The Original Storyline: The corrupt and oppressive Padista regime has kept the working people of Cuba in shackles long enough! Take the role of Ernesto 'Che' Guevara and Fidel 'Generalissimo' Castro as they liberate their people from under the jack-boot of the bourgeoisie regime... oh, and you have unlimited grenades. The homogenized US storyline: The people are under the boot of the oppressive regime of an evil king. You and your comrades must liberate your people from his tyranny. Free civilians and destroy the loyalist forces as you fight to take the island at all costs! ...oh, and you have unlimited grenades. Any guesses as to (on the left) the original text or (on the right) which island the map is based on? Fortunately, SNK had created a game so good that no one noticed the changes -99% of gamers saw a really cool game with an interesting Latin revolutionary theme. 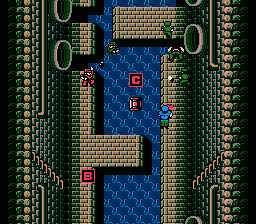 SNK did an admirable job of redrawing the arcade graphics for the NES. All the characters look sharp, the backgrounds look credible, and the cut scenes are beautifully drawn. The only flaw is some pretty heavy flicker when dozens of enemies, bullets, hostages, and explosions appear on screen at once. Then again, considering the hardware, its a worthy trade. The NES never sounded better. The game is saturated in memorable, pulse pounding tunes. I've always been amazed a the sheer number of explosions you hear throughout Guerrilla War. 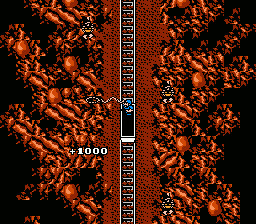 Just when you think you've been numbed by the hundreds of explosions that saturate the levels, a boss will explode: shaking the screen, creating a neat flicker-flash effect, and making you murmur an almost instinctive "Yeah!" George Lucas once said sound was half of what made Star Wars so effective, I think the SNK team behind Guerrilla War agrees. 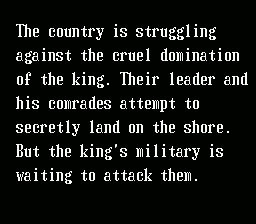 Guerrilla War set a standard for war games on NES. All auto-fire weapons, unlimited grenades, multiple power-ups, unlimited special weapons, tanks, you name it. The folks at SNK were even kind enough to give a player unlimited continues. On the one hand, you can just charge through the game carefree, guns-a-blazin' (which is quite fun, especially with two players). Of course, with that strategy you'll get a very low score for hitting hostages which are +1000 points if you rescue them, -500 if you kill them (And there are a lot of them). If you're feeling a bit more skillful, you can try and go through the game a bit slower and try and rescue the hostages. This can get difficult because a powered-up weapon on automatic auto-fire can make mincemeat out of hostages with a simple "whoops, one shot too many." Combine that problem with hordes of attacking enemies and you'll find that playing for points can be a tough task for even seasoned gamers. "I am neither a Christ nor a philanthropist. than let myself be nailed to a cross or whatever." "Che was the most complete human being of our age."